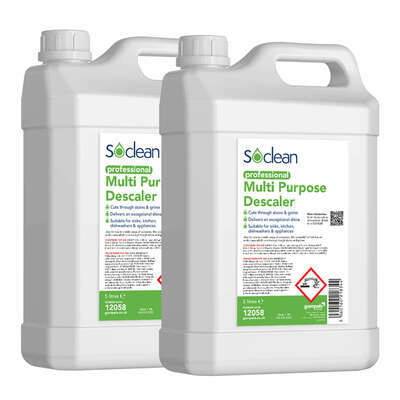 I cant seem to find bottle labels for the descaler? Unfortunately we do not stock these labels, but I will add it to the wish list for future products. We do offer code 47866 - Plain Labels for Trigger Bottles x 6. Maintain the high levels of cleanliness and hygiene expected in all work environments with our Gompels Multi Purpose Descaler 2x5l. Ideal for use in a wide range of scenarios, this powerful formula has an acidic base which cuts through tough stains and grime to deliver an exceptional shine. Used everywhere from catering equipment, sinks, dishwashers and regularly used appliances such as kettles, this large multi pack provides enough cleaning power to remove even the deepest of stains. An economic option for everything from nurseries through to care homes and everything in between. Our Janitorial Supplies category is packed full with everything from Cleaning Cloths and Concentrated Chemicals through to Laundry Detergent and Floor Cleaners.